Saturno RA - round table table (diam. 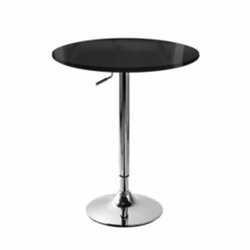 460mm), chrome-plated central leg, adjustable height (90-110cm). Top colours: uni colours (white, black, red, etc. ), wood colours (wenge, cherry, mahogany, etc. ), or glossy colours (white, black, red). Suitable for bar, pizzeria, hotel, pub, restaurant at the best value for money.